There are a number of foundation options available for use with tension fabric buildings. While cost is always a factor, the first consideration in determining the proper foundation is whether the installation is a temporary or permanent structure. 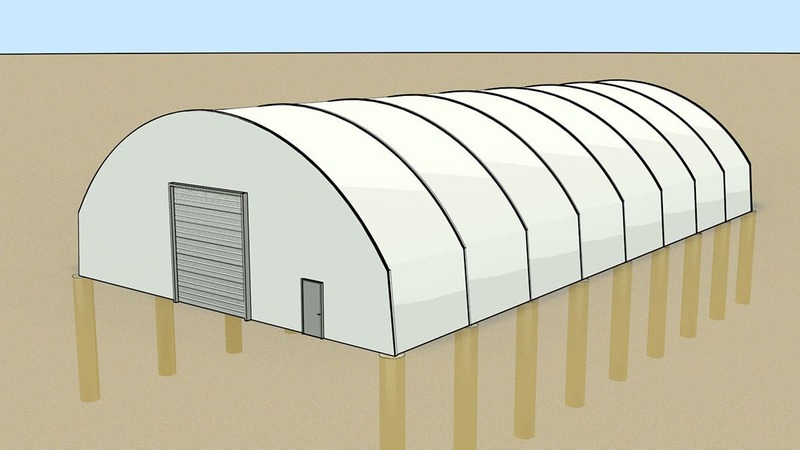 Generally, temporary tension fabric building foundations will be less expensive to install but are limited in the size of buildings they will support, and will not match the longevity of permanent foundations. Temporary foundations do not normally require heavy machinery or a large workforce to install. 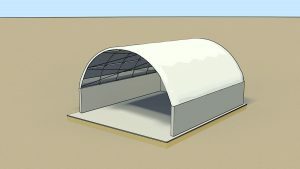 Often a couple of people with common tools can prepare a temporary fabric building foundation. 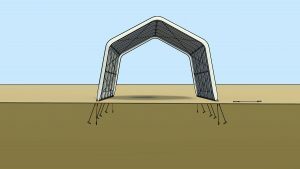 Temporary building foundations, most of which do not include a sub floor, work well for agriculture buildings, riding arenas and work areas. 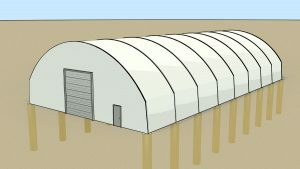 Many temporary building foundations will leave little or no environmental footprint behind once the building is removed. Permanent foundations, often chosen because they feature a solid, durable floor as part of the foundation, are well suited for sand and salt storage buildings, fertilizer storage buildings, water treatment plants, recycling facilities and aircraft hangars. 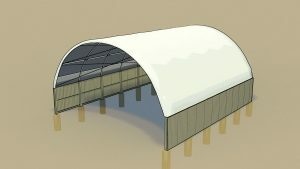 In the following section we will review the common foundation methods utilized for tension fabric buildings. A Hogan stake foundation consists of a series of high tensile steel stakes driven into the ground with a sledgehammer or a jackhammer. Typically two stakes are required at each base plate. Hogan stake foundations are usually used as temporary foundations and can be easily removed along with the building. The foundation can be installed with minimal resources and manpower with a low overall cost. This option works very well in sheltered environments. 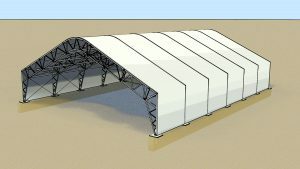 This foundation is suitable for smaller fabric structures. DUCKBILL® anchors essentially work like a toggle bolt in soil. The duckbills are driven into the ground providing a safe and environmentally sensitive installation. An upward pull on the anchor tendon rotates the duckbill into a perpendicular “anchor lock” position. Typically used as temporary foundations, duckbill anchor systems offer effective, lightweight and economical anchoring solutions. Duckbill anchor foundations can be installed with minimal resources and manpower with a low overall cost. This foundation is suitable for smaller fabric structures. Helical Anchors or Screw Piles are a great option for agricultural or commercial installations. Helical anchors are driven into the soil at each truss footing using hydraulic equipment capable of measuring the KPI resistance. Sizes of the piles will be determined by the size of the structures and soil conditions. Helical anchors can be used for permanent applications or temporary applications where no footprint is required upon take down. Helical anchors require some hydraulic equipment but can be installed with minimal manpower at a reasonable cost. This foundation is suitable for medium to large fabric structures. Wood post mount foundations are a great option for structures 62’ and narrower. Wood posts are often utilized on agricultural installations for hay shelters, calving barns and even smaller riding arenas. The most common post sizes are 8”x8” treated posts, installed 4’-6’ in the ground and stand 4’-6’ above grade. Most installers will tamp the posts using pea gravel and cement powder. Wood post foundations can be installed with minimal resources and manpower with a low overall cost. Ballast Block foundations are a popular and easy to install foundation for fabric buildings. Generally ballast block foundations are used for commercial and industrial projects. These foundations can be designed and stamped by local engineers when required. Ballast block foundations are popular because they are 100% re-locatable, and leave no footprint behind if the building is relocated. Ballast block foundations require heavy equipment to install but are one of the most cost-effective and versatile foundations for larger buildings. 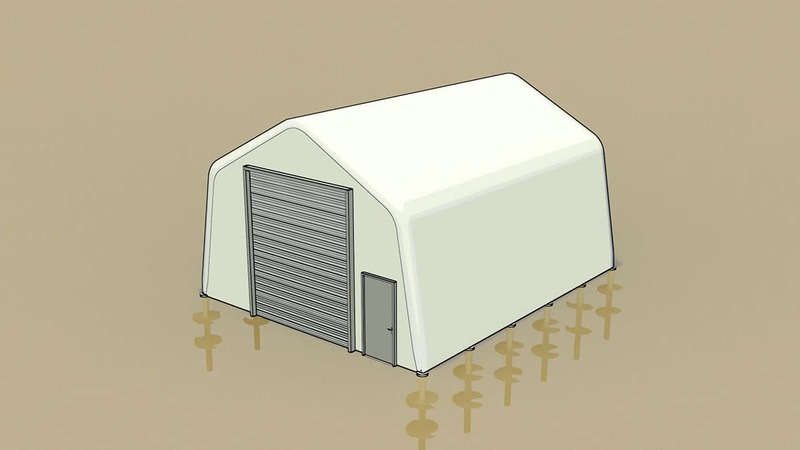 Shipping containers can be used as an easy, cost-effective and versatile foundation for fabric buildings up to 62 feet wide. Truss base plates are simply attached to two shipping containers to provide an extra 8’-9’ of raised foundation for fully enclosed or open end buildings. 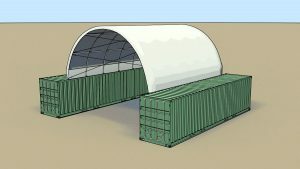 Container foundations can be designed and stamped by local engineers allowing them to be used in almost any application. Shipping container foundations require heavy equipment to install but are one of the most cost-effective and versatile foundations for small to medium fabric buildings. Poured-in-place concrete piers are created by excavating shafts at each truss footing, inserting concrete forms and pouring concrete into the form. Truss base plates embedded in the poured piers allow the building to be mounted on grade, or at ground level. Poured in place piers are normally used as permanent foundations. Pier foundations require a considerable amount of resources and manpower for installation. This foundation is suitable for medium to large fabric buildings. A grade beam or grade beam footing foundation consists of a reinforced concrete beam that transmits the structural load into spaced foundations such as pile caps or caissons. The grade beam foundation is built by excavating the footing area, inserting concrete forms, and pouring concrete into the forms. Grade beam foundations are employed as permanent foundations. Grade beam foundations require a considerable amount of resources and manpower for installation. This foundation is suitable for medium to large fabric buildings. A complete poured-in-place foundation is constructed by pouring concrete into a form with steel reinforcing. 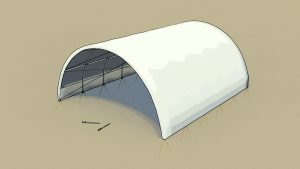 Poured-in-place foundations can also feature pony walls, or knee walls, which are concrete formed walls that the fabric building is mounted on. Poured-in-place foundations provide a solid conventional floor, and are considered permanent foundations. These foundations require a considerable amount of resources and manpower for installation. This foundation is suitable for medium to large fabric buildings. 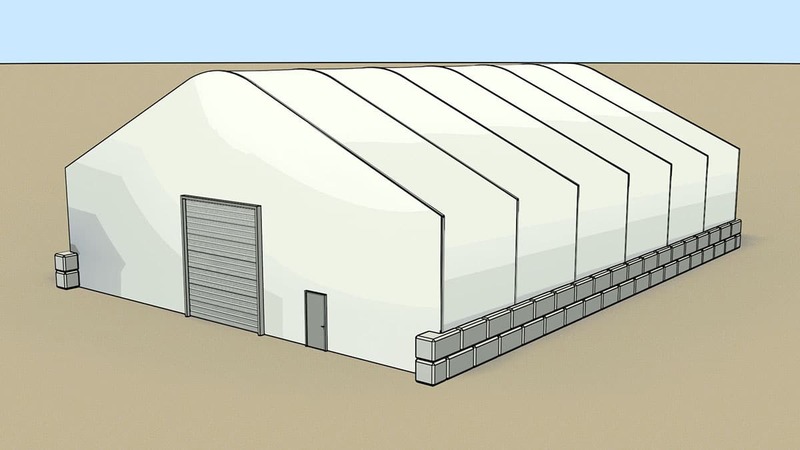 Click here to download the Ask Peter: About Tension Fabric Building Foundations white paper. 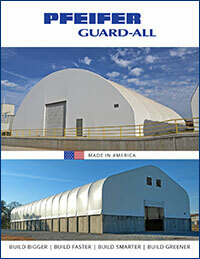 If you want to know more about tension fabric building foundations, ask Peter by calling him at 1-877-397-1594.